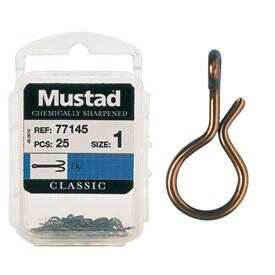 These bronze snap hooks from Mustad help save time having to re-tie flies and allow limitless fly changes. Exhibits more life to lures and nymphs and induces more takes. Mustad 77145 Snap Hooks These bronze snap hooks from Mustad help save time having to re-tie flies and allow limitless fly changes. Exhibits more life to lures and nymphs and induces more takes. Size 1 is suitable for hook sizes 4 to 8, size 2 is suitable for hook sizes 8 to 12 and size 3 is suitable for hook sizes 12 to 16 Saves having to re-tie droppers and allows limitless fly changes Exhibits more life to lures and nymphs induces more takes Supplied in boxes of 25. Looking to buy some Rig Components as part of a fishing gift? If you would like some advice on purchasing Rig Components, simply contact our expert fishing team, giving us either an email or phone number on which to contact you and we'll get back to you right away with the best advice and prices. FREE Delivery on all Mustad Rig Components over £100!! !